ICOs are launched by blockchain startups to raise funds to develop and deploy their project and to meet the operations costs for a few initial years. Since 2013, we have seen several ICOs and reverse ICO come and go, many of those have succeeded and even more have failed. Anyhow, ICOs have helped numerous entrepreneurs to raise funds for developing their projects in a hassle-free process as compared to VC funding. What if I already have a running project? Can I still hold an ICO for it? This question is probably thought by every entrepreneur who already has a running project but still needed more funds to expand their business. Well, the two-word answer to the question is Reverse ICO. Companies can launch an ICO with a label of ‘reverse ICO’ to decentralize themselves to remain competitive. Here, the company is already having a centralized business model but it decides to tokenize the business model such that the governance of the business is more decentralized. 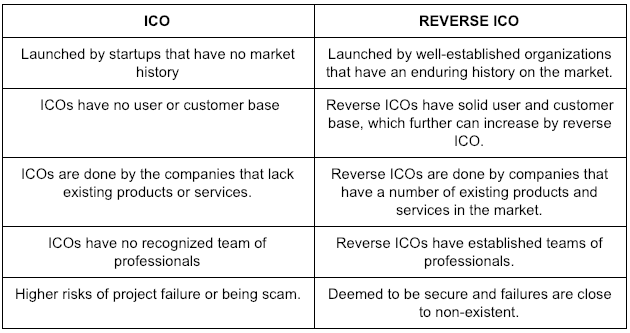 Since the fact that reverse ICO is directly affecting a running business, launching a reverse ICO is far riskier than launching a normal ICO. A decentralized business model with crypto tokens is a great strategy to align the interests between founders, their customers and other parties involved in the ecosystem. This has proven to be effective for blockchain startups and even have bigger promises for already operational companies. The main advantage of reverse ICO is that the company behind it already has a working business model. This attracts ICO investors more as compared to other ICOs which are yet to develop a product and reliable business model and market acquisition plans. Moreover, the company going for reverse ICO already have valuable assets to back their tokens. Assets can be user base, subscriptions, revenue or anything. Assets backed tokens are more likely to succeed in the crypto market, due to that, investors love tokes which are backed with solid assets. Need support for launching your ICO ? Increased Value Proposition – The company that is launching a reverse ICO already has an established customer-base, hence, market entry is a lot easier. Already Existing Infrastructure – In reverse ICOs, the project relies on an already established team and infrastructure which enhances the productivity of the project. Reduced Risks – Risk of project failure is reduced as compared to a normal ICO. Since an established company is launching the ICO, which is harnessing the prominence of blockchain technology to further expand its capabilities. Proven Track Record – Investors can easily evaluate the track record of the company to look at their performance over time and determine whether or not to invest in it. Can you launch a reverse ICO? Knowing the benefits of ICO, one would definitely choose to launch an ICO to raise funds over traditional VC funding. However, there is a limitation to launch a reverse ICO. The very first aspect you need to check is whether your business model can be decentralized. Not all business models are friendly to decentralization. For example – if your business is in selling your products through an online platform, reverse ICO is not a good fit to raise funds to expand this business. Because, when you offer tokens to ICO investors, you have to offer a token value along with it. In this case, it can be – to buy products from your platform using the tokens for a discounted rate. Which is not a sustainable model without a well-structured business plan to accommodate the tokens in the business model — the project is more likely to fail. On the other hand, Consider another business — say a cloud storage service. In such a business, decentralization is easily implementable by incentivizing the customers to share their unused hard drive space. Here, the expansion of the business via decentralization is more feasible as more customers opt to share their unused resources. The process for launching a reverse ICO is almost similar to launching an ICO. You can read more on how to launch an ICO here. As ICOs have already caught the attention of the general public, we can see more of reverse ICOs and STOs in coming years as it benefits the companies to raise more funds which can be used to revamp and expand their business. Moreover, decentralizing the infrastructure with a crypto token puts the company in a better position to be part of the new token economy. Thinking how to launch ICO for your business? Reach out to us today to schedule a call with our experts. Ditto is an IT executive with hands on experience in Software Development, Software Architecture Development, Business Development Management, Corporate Management, Project Management, Implementation, and Strategy. Always a step ahead in adopting the latest trends and solutions that are beneficial for the organization and general public. Strives to develop and come up with ideas with the aim of improving the livelihoods of others. How secure is your Smartcontract? How to launch a compliant ICO – Private ICO ? Why KYC compliance is necessary for ICO?